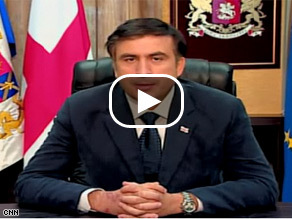 Watch the entire interview with President Saakashvili. (CNN) – Georgian president Mikheil Saakashvili on Wednesday called for John McCain and other American leaders to do more for Georgia in their response to the conflict in his country. McCain’s foreign policy adviser Randy Scheunemann told reporters on the campaign plane Tuesday that McCain’s remark “obviously meant a lot to Saakashvili personally, but more importantly the message it conveyed to the Georgian people in this really, time of unprecedented national emergency.” Scheunemann said McCain and Saakashvili are friends who have speaking daily throughout the crisis. But Saakashvili said action is more important than rhetoric in the face of “brutal” and “deliberate” Russian violence. He urged the United States to take the lead in installing an international peacekeeping force. “What Americans should do know, first of all, clearly make known their intentions,” he said. Wait...I thought these guys were Black Sea jet skeeing buddies who speak on a daily basis. And I thought it was Obama who was the man of empty rhetoric? Wasn't it McCain that chided Obama for being all talk, no substance? This is the same thing, especially since he has no power to do anything of substance! Talky, Talky, Talky! I hope the Georgian president isn't holding his breath for action from the US. Our lame decider is enjoying Olympics. He and Mccain can only offer tough talk and no action. How can we slap Russia's hands when we have occupied Iraq for six years without provocation ( no WMD's, or 9/11 connection). Don't we owe money to Russia, China and half the middle east, kind of hard to be tough with a straight face when you owe billions. McCain has been calling for the Russian's to be expelled from the G8 for their actions. This is more than Obama can offer, but I'm sure Obama will adopt this position soon and say it was his position all along. John McCain just put himself between a rock and a hard place. How will he backpeddle out of this one? I'd say that is a CHECK, by the Georgian President, and you only have one move left. Putting your queen, squarely, in front of the King. Mate in ONE, do you wish to resign? Should have kept your mouth shut and now you have screwed up the remote chance of using this to your favor. If you do nothing, you will be shown as only paying lip service and a phony. If you think of military action, you will be painted as even more of a Hawk that you are. John wants another Cold War so that he can finally live up to DADDY's Expectations and reputation. I don't want a president with unresolved Daddy Issues. What's it going to be, John? It's your move. Funny, I won't be surprised when the Crickets start chirping. oo ouch thats gotta hurt for mccain, the georgian president just gave him a verbal slap in the face. Give it up mcsame, america isnt falling for that foregh policy crap that u think u have, your empty double talk express isnt conveying anyone you neocon puppet. too bad for the old horse. the goergian president must have read the minds of millions refusing to be fooled by McCain scary word abt WW111. vote McC only if we need a war maker. that was his only strenght, nothing else good has ever come through him. the world need PEACE not WAR please! I agree with you, well said. We only don't have the moral standing to help another country if we choose to not help another country. Our actions in Iraq have nothing to do with other conflicts around the world. If we want to help Georgia we can go help Georgia. It is immoral to sit by and watch a democracy be invaded by another country. Iraq wasn't a democracy; we went in to overthrow a dictator and free a country; Russia is trying to do the exact opposite. I completely agree you with everything you said 100%. This shoot-from-the-hip cowboy diplomacy of saber rattling and what is it getting Georgia, nothing. I am glad the Georgian President called out McCain saying hey all these words are fine and dandy but where are the deeds and you will see that McCain has no response. But despite all of that, we have a President and we have not heard a peep out of him since getting back from the olympics on this topic. So once again McCain and Bush are lock step on just sabre rattling and doing nothing and they criticized Obama for having a measured response until more facts from the ground known. Yes this is a perfect example of how McCain will be just like Bush and we need a new direction and someone who can handle crisis, vs. just saying that they jet skiied together. If Obama had said that the media would have been all over him for being elite or whatever. We don't have have enough troops due to the Iraq War to help Georgia and McCain and Bush both know it. I applaud Saakashvili for telling McCain to put up or shut up and that McCain's words mean nothing. Yeah...right, McCain can't even pronounce his name right, this is laughable! Also, McCain just lost leads in Tennessee, Alabama, and Florida. For saying that today, We are all "GEORGIANS". The Volunteers, Crimson Tide and Gators all disagree with you. Saakashvili was sold down the river by the current administration, so now that he's in a jam he's turning to his buddy, John "I vote with the President 95% of the time" McCain to turn things around for him? Ain't gonna happen, even if Johnny-boy made it sound as if it would. The U.S. has no credibility in this matter. Only the Europeans who refused to join in the illegal invasion of Iraq can take the moral high ground here and work toward a resolution. Yeah, we're all Georgians until it might cost us something - then we're ostriches. This is where John Wayne -Mc Cain's big mouth can't chew all that cud his eyes think they see. We can't help Georgia, and everybody with half a brain knows this so the policy adviser is blowing smoke. And his campaign again shows how ignorant they are in tryin to criticize Barack on the little he said. You don't go yappin at the gums to a big bully who's pounding some little person especially if you can't defend the victim. McSame/Bush Clone is all talk. He spouts nonsense about how Obama is talk, but he's no different. "Going from words to deeds" is what got Georgia into this mess in the first place & even John McCain must know there's no way the US should touch it with a ten-foot pole. But maybe McCain has never heard that expression about speaking softly & carrying a big stick, or maybe he's got it backwards. Words vs. deeds... isn't that the comparison McCain's campaign was trying to make with Obama?